Example 7 For each of the following statements, determine whether an inclusive Or or exclusive Or is used. Give reasons for your answer. (i)To enter a country, you need a passport or a voter registration card. Since a person can have either passport or voter card or both to the enter country. Here, Or is inclusive. 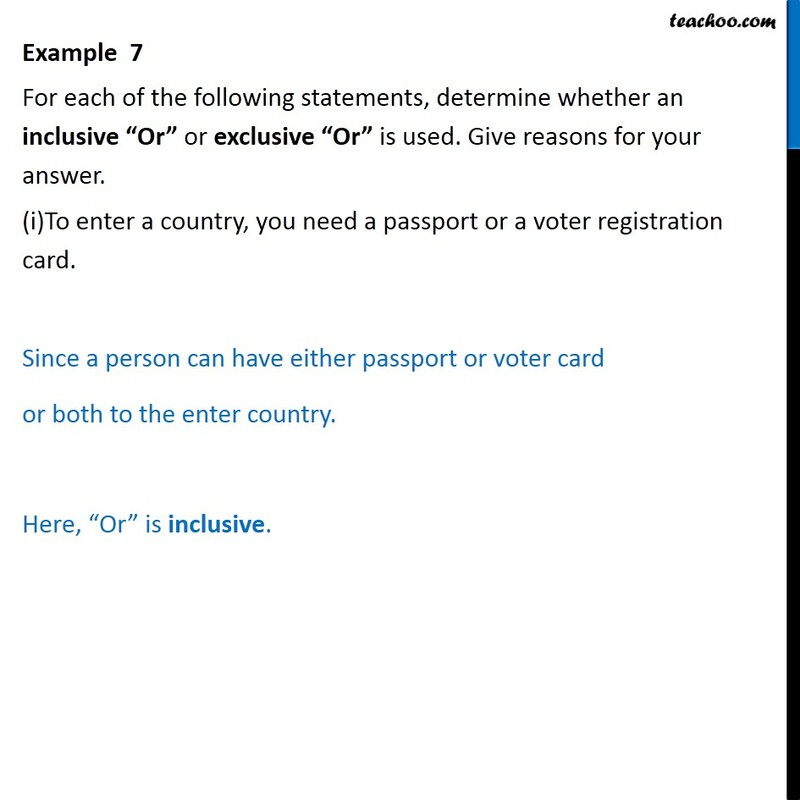 Example 7 For each of the following statements, determine whether an inclusive Or or exclusive Or is used. Give reasons for your answer. (ii) The school is closed if it is a holiday or a Sunday. Since School is closed on holiday as well as on Sunday or both. Here, Or is inclusive. Example 7 For each of the following statements, determine whether an inclusive Or or exclusive Or is used. Give reasons for your answer. (iii) Two lines intersect at a point or are parallel. It is not possible for two lines to intersect and parallel together. Here, Or is exclusive. 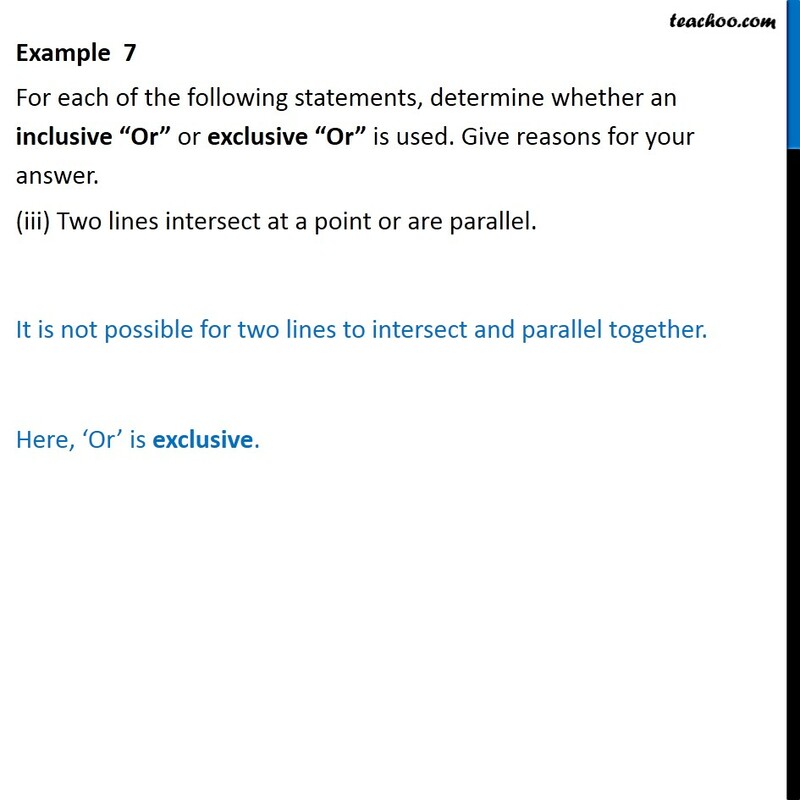 Example 7 For each of the following statements, determine whether an inclusive Or or exclusive Or is used. Give reasons for your answer. (iv) Students can take French or Sanskrit as their third language. A Student cannot take both French & Sanskrit as their third language. Here, Or is exclusive.